This week saw the first of the new Hornby ‘Original’ Merchant Navy Pacifics hitting the retailers, see my Talking Stock #35 post here for more details and also the full size ‘Rebuilt’ Merchant Navy Pacific 35006 Peninsular & Oriental S. N. Co. steaming in public service for the first time in 2017 on the Gloucestershire and Warwickshire Railway (GWSR) for the week of services allied with the Cheltenham Races Festival. With this in mind I thought it was time that firstly I finished my model of 35006 in her as preserved guise (being a shareholder), and also that I mentioned the Rebuilt Merchant Navy Pacifics on this blog, although they are of course out of my usual 1946-49 modelling period. Although in general the Merchant Navy class as introduced were a success, proving to be powerful and very free steaming, one of the outcomes of the less than scientifically carried out Locomotive Exchange trails in 1948 and further performance and efficiency tests carried out at the Rugby Stationary Test Plant between March 1952 and January 1952, showed them to be costing a lot in: coal, water, oil and secondly maintenance when compared to other classes. These costs along with issues of leakage of oil from the enclosed motion oil baths and the reliability and accuracy of the steam reverser / cut off setting led to the Southern Region looking at options to improve the engines. The option chosen as opposed to trying to overcome the individual issues was to rebuild the engines with more ‘standard parts’. Rebuilt 35006 in the sunshine at the Gloucester and Warwickshire Railway. The task was given, in 1954, to R.G. Jarvis of the Chief Mechanical and Electrical Engineer’s Department at Brighton, his new design replaced the encased oil bath and chain driven valve gear with three sets of more traditional Walschaerts valve gear, new style piston heads and rods, regulator and a screw-link type reverser. The ashpan and grate were also replaced and included hopper bottom doors and front and rear dampers. A new fabricated smokebox, superheater header and steam pipes were also fitted. The frames, outside cylinders, boilers were retained along with the: Bullied-Firth-Brown wheels (although now needing balance weights to be fitted), axleboxes, the efficient ‘clasp’ locomotive brakes and the ‘Stones’ steam generator for electric lighting both for the engine headsignals and in cab lighting. The same tenders were utilised, albeit with the side raves cut down to ease water filling access and reverse running view. The drawbar between the loco and tender however was replaced. Reflecting on superb standard of external finish on 35006. Externally the ‘Air Smoothed’ casing was removed giving the look common to the recently introduced BR standard classes, although the characteristic oval shaped smokebox door was kept. Sanding, from replacement sandboxes, was also added to the leading driving axle, whilst rearward application was incorporated to the middle driving axle and new mechanical lubricators were accessibly mounted on the running plate alongside the boiler. In 1955 the British Railways Board gave authority for fifteen of the class to be modified and authority for rebuilding the remainder swiftly followed. In February 1956 Eastleigh works released 35018 British India Line in its newly modified form (35018 as the prototype rebuild remained unique to the rest of the class as the front sandbox filler position and injector pipework differed), by October 1959 all the class had been rebuilt. Performance of the rebuilt engines was indeed successful, solving most of the maintenance issues, although one drawback was that they put greater loads on the track, than the largely self balanced originals, as a result of increased hammerblow, caused by the balance weights required for the Walschaerts valve gear. The release by Hornby in the year 2000 of the rebuilt Merchant Navy locomotive heralded a new generation of model steam locomotives by Hornby and was a step change of standard of models reactive to competition in the market place and gave us a new super detail standard featuring blackened finish handrails and wheels with etched brass valve gear, detailed cab interior, and a five pole motor housed and driving within the locomotive itself. 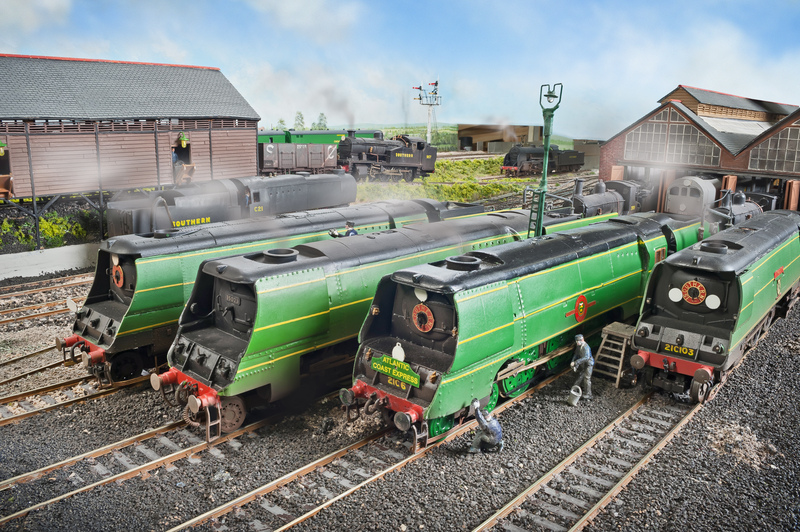 Over the years a number of the class have been released with a few modifications to the tooling along the way, although as yet none of the first series engines as rebuilt have been released as the 5000 gallon style tenders they were paired with have not been tooled. As 35006 in preservation has been paired to a brand new built larger 5100 style tender I have used a Hornby R1038 35012 United States Lines (split from a train pack) locomotive as the basis for my model. Firstly I removed the cabside number numbers via my usual method of soaking the Hornby printing in enamel thinners and rubbing off with a cotton bud and replacing with HMRS Pressfix decals. New nameplates and smokebox door number plates were fitted along with an extched 72B Salisbury shedcode plate on the smokebox in the slightly higher position than usual, level with the lower smokebox hinge, on 35006 which was a charactoristic of her when in service. All the plates were obtained from Fox Transfers. I replaced the front steps as supplied by Hornby by the more robust lost wax cast versions, along with a set of the cylinder drain pipes to complete the front end look, obtained through RT Models, from his excellent Albert Goodall range. As I am modelling 35006 in her preserved condition I want to to also represent her superb external paintwork finish with a reflective and classic oily rag polished hue and have therefore given the model a coat of Kleer floor polish to give a such a finish to the paintwork (and also seal in the decals). More details of 35006 and the locomotive Society can be found on my dedicated page here. Also it is worth mentioning the 35011 The General Steam Navigation Locomotive Restoration Society that was formed last year with the intention of not only restoring 35011 back to working order but doing so back in original air smoothed condition condition complete with Bulleid’s oil bath encased valve gear incorporating chain drive elements to fill the gap in preserved examples left by the entire class having been rebuilt. As promised in my recent Warley 2016 update post this post is about the first four original Air Smoothed Bulleid Merchant Navy pacifics being released by Hornby due in the first quarter 2017. The main purpose of this post is to advise the exact condition and dates applicable to all these four versions which I hope will assist those wishing to purchase the correct version for their time period or those potentially wanting to renumber to other members of the class. General details of the 3 distinct Series of Merchant Navy pacifics can be found on my talking Stock #1 post here along with some additional information on the initial liveries and tenders for the some of the Series Three Merchant Navy pacifics on my Talking Stock # 24 post here. So far as you can see below Hornby are releasing two Series One versions in early 1941 and 1941 to 1943 condition respectfully and two Series Three versions in early 1950’s condition. It is assumed that other style Series One, Three and hopefully Series Two versions and liveries will follow in subsequent years. 21C1 ‘Channel Packet’ as modelled by Hornby in very early condition. Note this does not have the supplied detail pack added yet, such as cylinder drain pipes and steps etc. R3434 21C1 ‘Channel Packet’ only represents her very early condition from when first introduced in February 1941 and May 1941. She has the original front end design known as ‘Widows peak’ without smoke deflectors, the area around the chimney filled as first designed and the sliding chimney cover, that was supposedly to be used to cover the opening. The Smokebox door ‘Southerm’ roundel is the inverted horseshoe (later changed to a full circle with addition of the engine build date due to complaints that such an inverted horseshoe was a sign of bad luck). She also is fitted with the cast gunmetal number and ‘Southern’ plates that she carried until renumbering to 35001 in September 1949 and has the front number plate position being on the sloping section. when not in steam. It should also be noted in this condition she had silver coloured cab window frames and only had front steps fixed to the front right buffer when looking at the front rather then both sides. By May 1941 step cut outs were added to the sloping face and the lamp irons and electric lamps moved to just above the vertical face on the front hence also the relocation of the cast number plate to the vertical face. It should be noted that whilst number 21C2 also carried the gunmetal style number and ‘Southern’ plates until renumbering in January 1950, she did not have the same chimney and cover arrangement as 21C1, as a greater opening was present around the chimney. Hornby 21C3 ‘Royal Mail’ in 1941 condition. Note this also does not have the supplied detail pack added yet. R3435 No. 21C3 ‘Royal Mail’ is as introduced in September 1941 condition again with the ‘widows peak’ style front end without smoke deflectors but with the opening around the chimney and the slot in the front face above the smokebox. She was painted in wartime black livery in May 1943 and gained the front end modification in September 1944. Numbers 21C3 to 10 of the first series of 10 differed from the rest as the side casing was made from Limpet board material to reduce wight and are identifiable by the overlapping seam running horizontally along the side, the position of middle yellow line when in malachite green livery was adjusted to run along the top of this seam. 21C4 ‘Cunard White Star’ – to black July 1943, front end modification January 1944. 21C5 ‘Canadian Pacific’ – to black March 1942, front end modification March 1944. 21C6 ‘Peninsular & Oriental S. N. Co’ – to black May 1942, front end modification April 1944. 21C7 ‘Aberdeen Commonwealth’ – introduced in black June 1942, front end modification August 1944. 21C8 ‘Orient Line’ – introduced in black June 1942, front end modification June 1943. 21C9 ‘Shaw Savill’ – introduced in black June 1942, front end modification June 1943. 21C10 ‘Blue Star’ – introduced in black July 1942, front end modification April 1943. This gives some options for renaming 21C3 into other members of the class and simply repainting into unlined wartime black if you model prior to August 1944. R3436 No. 35028 ‘Clan Line from the Third series of number 35021 to 35030 (being introduced post 1948 they never carried the Southern 21Cx numbers), is being released in BR Brunswick Green with early crest. She will be modelled without the fairings between the front of the cylinders and the buffer beam and with safety valves in the forward position representing the condition she ran in between June 1953 and December 1954 when the safety vales were resited to just in front of the fire box. R3382TTS No. 35023 Holland-Afrika Line’ is also being released in BR Brunswick Green, early crest and will come fitted with Hornby’s DCC TTS Sound. She will have the fairings between the front of the cylinders and the buffer beam and with safety valves in the forward position representing the condition she ran in between gaining Brunswick green in March 1952 and the fairings being removed in May 1953. 35021 ‘New Zealand Line’ – to Brunswick Green, from blue in February 1952, lost fairings in August 1953 and safety vales resited in October 1954. 35022 ‘Holland America Line’ – to Brunswick Green from blue in February 1952, lost fairings in May 1953 and safety vales resited in June 1956. 35023 ‘Holland-Afrika Line’ – to Brunswick Green from malachite green in March 1952, lost fairings in May 1953 and safety vales resited in October 1954. 35024 ‘East Asiatic Company’ – to Brunswick Green from blue in June 1951, lost fairings in May 1954 and safety vales resited in November 1952. 35026 ‘Lamport & Holt Line’ – to Brunswick Green from blue in June 1952, lost fairings in January 1954 and safety vales resited in January 1955. 35027 ‘Port Line’ – to Brunswick Green from blue in November 1953, lost fairings in November 1953 and safety vales resited in November 1954. 35028 ‘Clan Line’ – to Brunswick Green from blue in June 1953, lost fairings in June 1953 and safety vales resited in December 1954. 35029 ‘Ellerman Lines’ – to Brunswick Green from blue in July 1952, lost fairings in July 1952 and safety vales resited in December 1954. 35030 ‘Elder-Dempster Lines’ – to Brunswick Green from blue in May 1953, lost fairings in May 1953 and safety vales resited in October 1954. As stated above I hope that this information is of use for any readers wanting to either understand the relevant time period for the condition of each of the four Hornby releases and or assists with choosing possible candidates for renumbering and naming, so get pre-ordering now, you will not be disappointed by the model, not long to wait for them to arrive now! 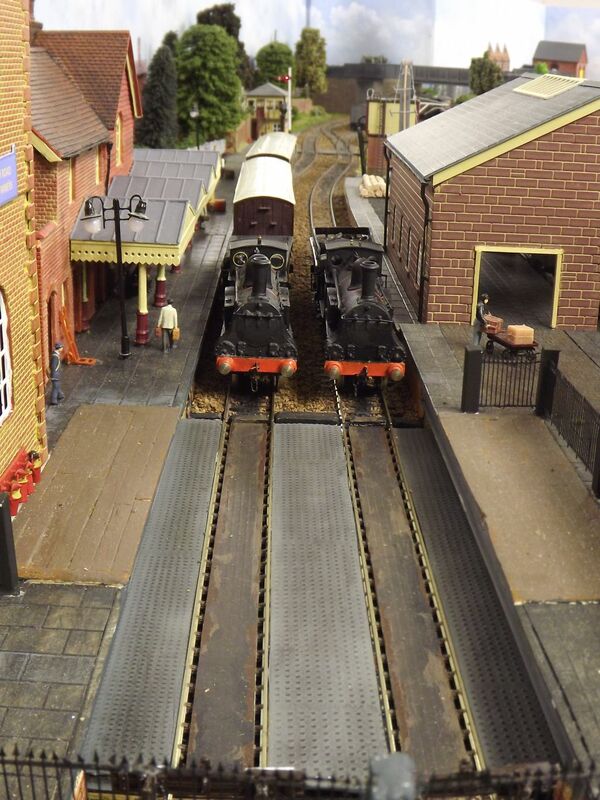 It has been a while since Fisherton Sarum last made an appearance at an exhibition, back in March at the London Festival of Railway Modelling in fact. 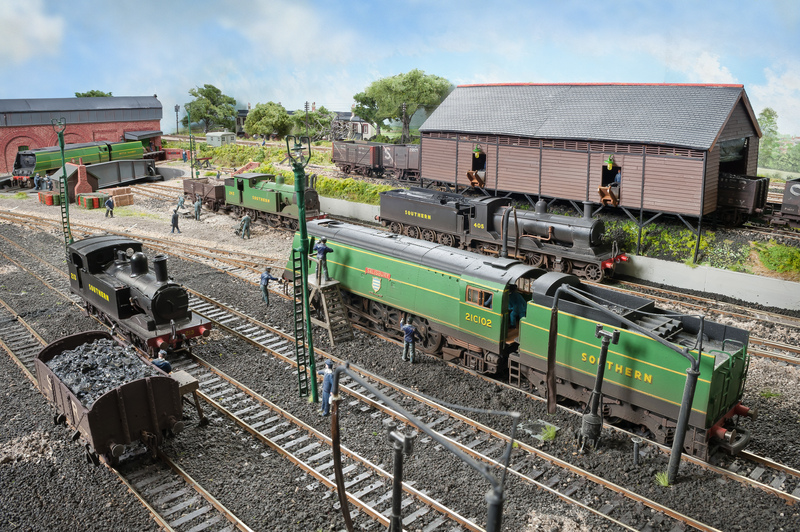 With the Summer (if it can be called a summer this year) now over the exhibition circuit is back in full swing and sees Fisherton Sarum at two shows in three weeks. It also sees the first time that we will have operated the layout at a show with the Control Panel located at the front corner of the layout, that should make interaction with the audience easier, although possibly more distracting from a operating perspective, but should be fun. The second outing is two weeks later 10th / 11th October 2015 at the Great Electric Train Show organised by the Hornby Magazine at the Heritage Motor Centre, Gaydon This is the third year that Hornby Magazine have organised this show which already has a reputation for being a quality show with a great line line up of layouts and traders, with the added bonus of visitors also being able to wonder around the Heritage Motor museum as well. Just to add to the buses analogy of three coming along at once, I am also at The Folkestone, Hythe & District MRC exhibition in between the two shows above on the 3rd /4th October assisting fellow High Wycombe and District MRS members Alan and Simon Paley with their delightful Pre-Grouping Midland and London North Western Railway layout Loughborough Road. Alan and Simon will also be assisting me with Fisherton Sarum’s two appearances so it is a pleasure to be able to return the favour. If you are able to come along to any of the above three shows please say hello it’s always good to meet you.